This incredibly simple soup recipe comes from David Lebovitz, as he was also launching into his own New Year’s resolutions five years ago. There is no cream involved, so it’s light in theory, but still impeccably creamy from the potatoes. 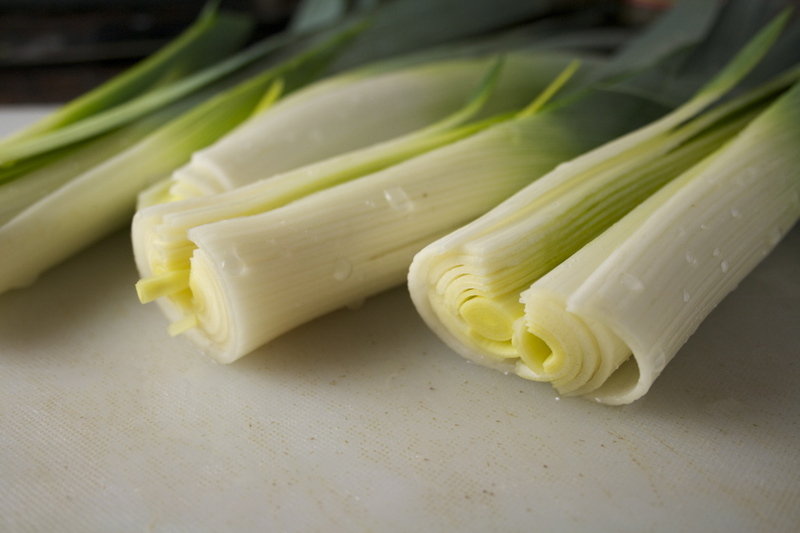 The leeks give it a mild sweetness, with a little less bang than onion but a gorgeous, earthy fragrance that compliments the potatoes beautifully. A hit of chile powder gives it a bit of spice, and the thyme gives it a hint of freshness, even in dried herb form. But it’s the potatoes and leeks that shine. The soup is subtle, simple, and wonderfully satisfying. 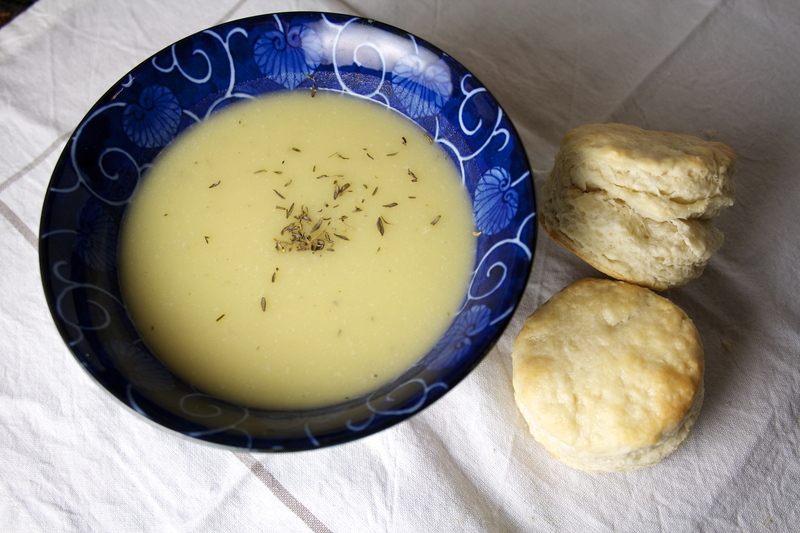 I sometimes like to make crepes or an emmenthal and butter sandwich on a baguette with this and pretend I’m back in Paris, but none of those things are made with buttermilk, and the carton was at its end, so biscuits became the soup’s simpler partner. Perfect for dipping, these are made with self-rising flour and come together — and by together, I mean mixed, shaped, cut, baked, and out of the oven — in 20 minutes. Perfect as a last-minute addition while your soup is bubbling away. And because self-rising flour is involved, you only need two other ingredients — buttermilk and butter — to bring them to life. Hearty, warm, simple, and satisfying — and stress-free. Pretty much the perfect way to start 2015. Thank you for taking these first steps into the New Year with me. Here’s to adding a little imagination to our lives. This soup is wonderfully adaptable — and gluten-free. Want to make it vegan? Use olive oil instead of butter. You can certainly use vegetable or chicken stock in place of the water, but be aware that it will definitely change the flavor — not necessarily a bad thing. If you do, though, make sure whatever stock you’re using is good, quality stuff. The potatoes and leeks are such a subtle combination that anything too harsh may overwhelm, which I found out the hard way the last time I made this. David also suggests using ¼ teaspoon of chile powder, which I found to be too much for my pathetic palette. I put in just a dash. Bay leaves are also included in the original recipe, but I leave them out every time. Why? Because I never remember I need them when I’m cooking, and when I finally did remember this last time, I couldn’t find them. Bay leaves do add another layer of flavor to your dishes, so if you have them, throw them in. I definitely will next time — if I remember to buy them. Heat the butter or olive oil in a large pot or dutch oven over medium heat. 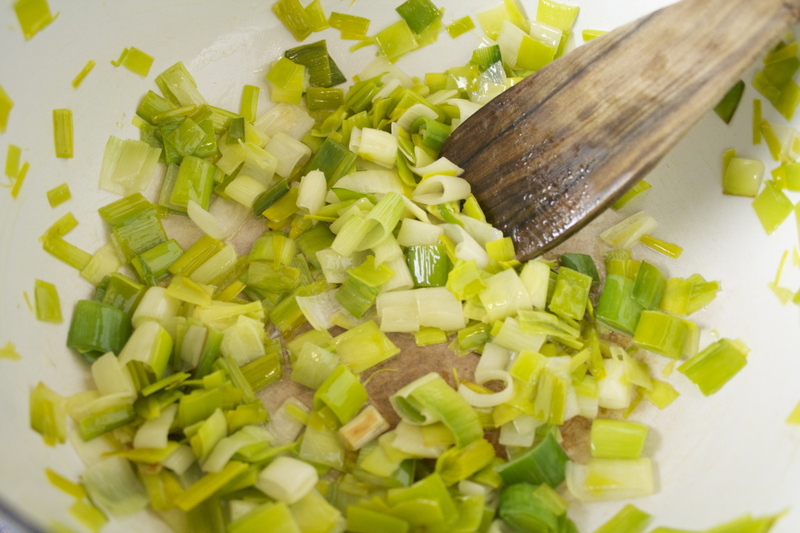 Add the leeks and some salt, stirring frequently, until the leeks are soft and wilted (5-7 minutes). Add thyme and chile powder, and stir for 30 seconds — this helps bloom their flavors. Add water, potatoes, and bay leaves, if using, and bring to a simmer. 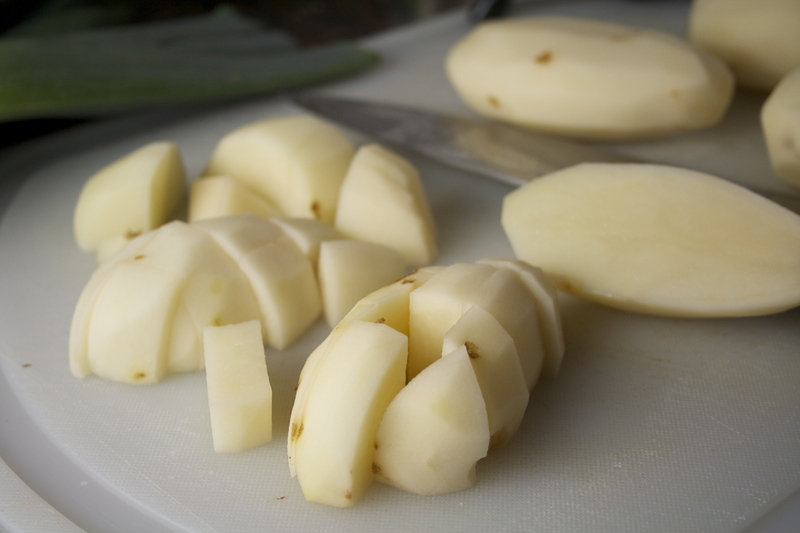 Cover and let simmer for about 15-20 minutes, or until the potatoes are tender when poked with a fork. Remove the bay leaves, if using, and blend until smooth using either an immersion blender (my favorite tool) or an upright blender. Season with freshly ground pepper and more salt to taste and serve. Preheat oven to 425 degrees with a rack in the center. Line a baking sheet with parchment (you can also simply use an ungreased baking sheet — I’m just lazy about cleaning up). In a large bowl, cut the butter into the flour with a pastry blender or a fork until the butter is coated and the size of large peas. There will be much less than in, say, a pie dough, so it will feel mostly like only flour here. 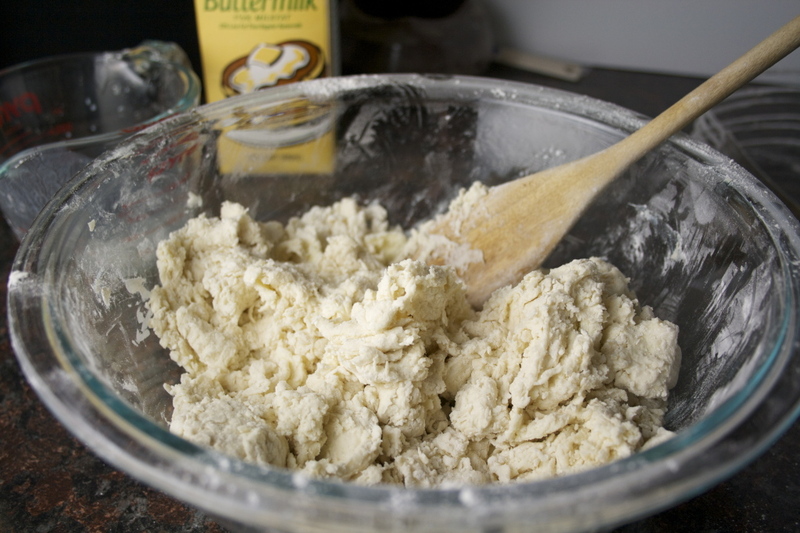 Add ⅔ cup of the buttermilk and stir until the dough comes together, adding more if it’s still too floury. Turn the dough onto a clean, lightly floured counter, pat it into a rectangle, and fold it over on itself several times, using more flour as needed to prevent it from sticking. 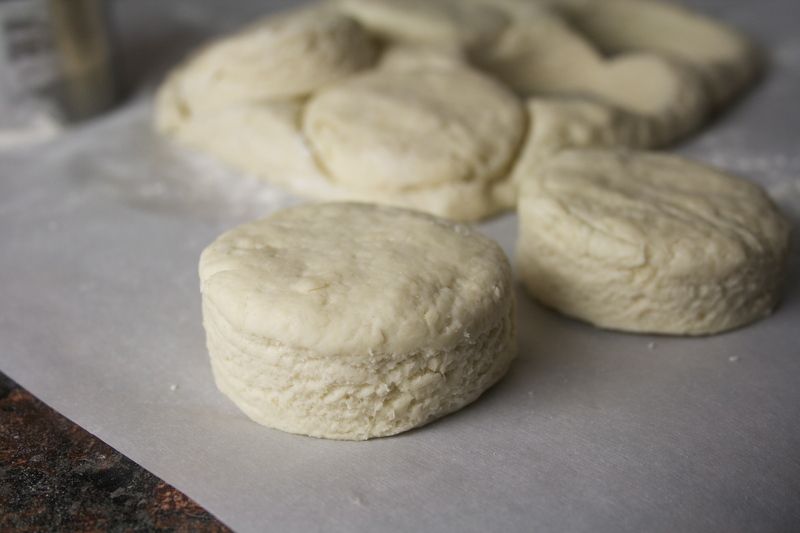 Pat the dough out into a rectangle or a round about ½-inch to ¾-inch thick. 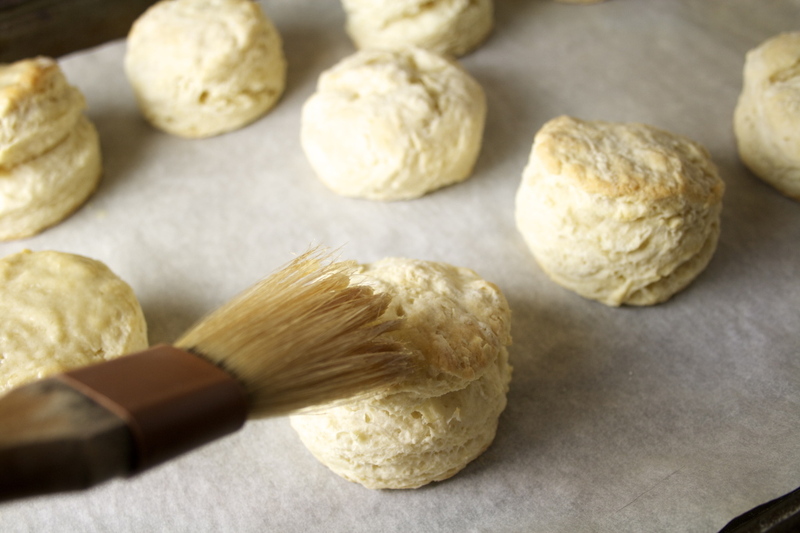 Cut the biscuits using a sharp 2-inch biscuit cutter, dipping the cutter in flour to prevent it from sticking. Push leftover dough together and keep cutting until you’ve used pretty much all of it up. 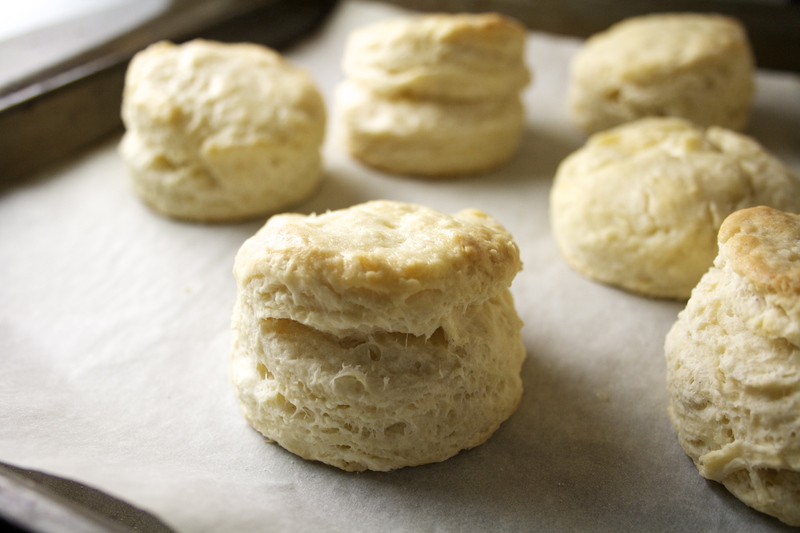 Place the cut biscuits on prepared baking sheet, and bake for 10-14 minutes, or until the tops are golden brown. Brush the tops with melted butter and serve. Ahh! I was going to ask you for a recipe for buttermilk biscuits! Can’t wait to try them. Thank you! Yay! I’m craving them right now — with your avocado, tomato & eggs. Happy New Year, Kate! Any recommendations on making the biscuits gluten-free? By default I use Bob’s Redmill generic flour replacement, but I know some mixtures are better adapted to certain baking situations. 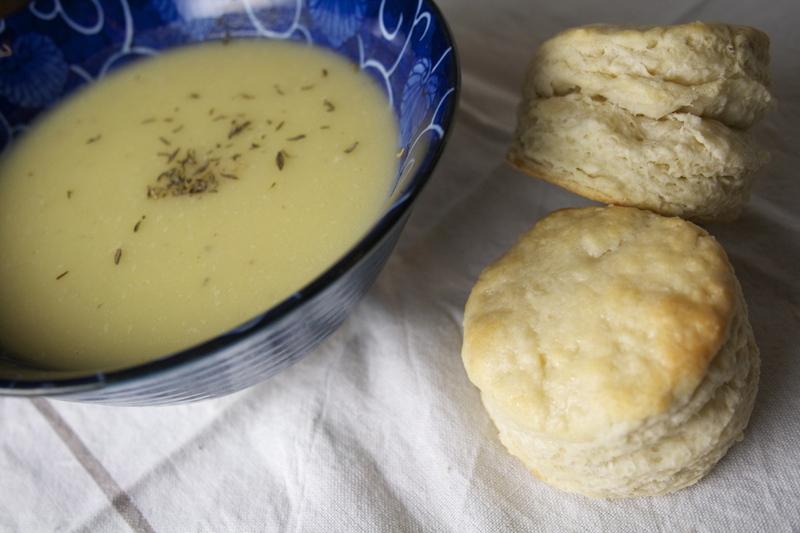 Hmm, this is a little tricky since I’ve used self-rising flour here, so we’re going to have to be creative and add leavener — but thankfully, it’s the same amount of flour as in the apple cheddar biscuits, so should be easy! Bob’s Redmill would probably be fine, but I think Cup 4 Cup or the King Arthur GF all-purpose are a little closer to the taste and texture of wheat flour.